This is a stipple drawing I did of my dream motorcycle. (Stippling is the process of making a drawing with nothing but dots). Folks always ask me how I do that… My reply is one dot at a time. These prints are available for a limited time…as I only have a few, so get yours before they are gone. 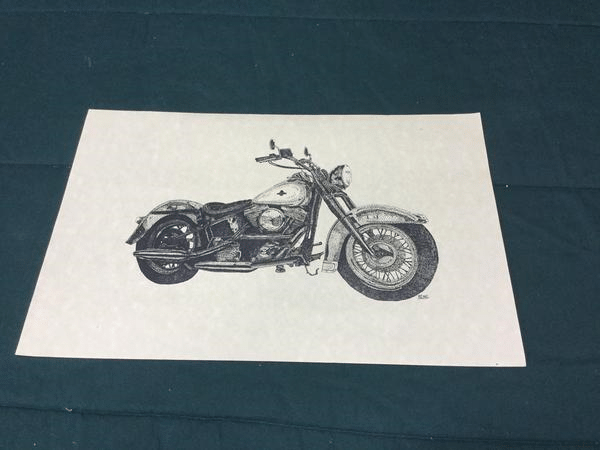 Also….can do custom stipple drawing of your motorcycle! Just contact us and provide photos. Allow 2 months for it to be completed. Give us a call to find out more.